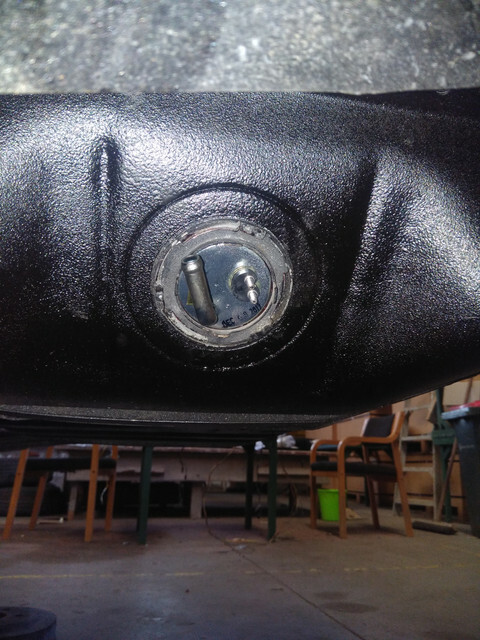 I have just fitted my new fuel sender inserting the tabs in the slots but even with s bit of grease on the locking ring it turned the sender clockwise a little bit. Is this alignment ok for the pickup and float to work correctly? This is how mine looks. I marked the position before removing and checked that the filter from the new unit was pointing down and the mechanism could move up and down. I think yours is pointing up a little too much! that might give you an off readin (not that they are that accurate). Also be careful with the lock ring, the aftermarket one didnt press the sending unit hard enough and caused the unit to leak. i had to use the original locking ring with the repop sending unit. That's odd that the new sender unit did not come with a lock ring and new gasket. What brand did you get? I checked Rock Auto for 71-73 Mustang sending units and they are again listing an INCORRECT part for our cars. They list Spectra Premium FG87A. This is the one I originally bought and the tube faces the WRONG WAY!!! In my case I was able to return it and exchange for the Dorman 692232, which is stainless steel, brass float. Unfortunately they no longer list this one. The only other one is SS, but out o stock. However they are supplied with lock rings and gaskets as yours should have been. I would make sure the one you bought is stainless steel, brass float with a good filter screen. If not take it back and buy a better one. The Ford part number is D1ZF-9275-AB (on the one I have). You will likely need to calibrate it as well. Use 5 gallons in an empty tank and adjust the float so it reads a 1/4 tank. Mine only showed 1/8th, so I needed to bend the float arm slightly downward. The trick is to jack up the left side until the sender can be removed without spilling gas all over the place. Then recheck it. It's a PITA,, but I like to know when I'm getting to a 1/4 tank. Here's a pic of the wrong part, just for reference. I have no idea what this is actually for, but as most Ford's have the fuel lines on the driver side, it is either for a tank with a center location or on the right hand side. I'm showing this so others won't buy this part. I'll also contact Rock Auto and point this out again! It's also listed on a couple of others and eBay. That's the one I now have. Very happy with it. Well made and good quality.